Illinois' growing number of farmers markets are the favorite shopping option for families looking for locally grown produce and products like honey, soap, wine, flowers, spices, eggs, cheeses, preserves and more. Not only will you find the freshest and tastiest seasonal fruits and vegetables at farmers markets, you'll be supporting Illinois farmers, artisans and small business owners. You'll also be doing your part to protect our environment. On average, food travels 1,500 miles to get to your plate. This transportation uses natural resources like fossil fuels, contributes to pollution, and creates excess trash with extra packaging need for transporting. 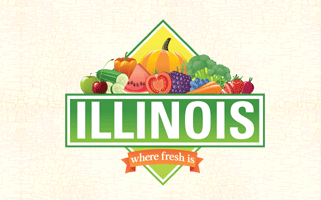 Illinois Department of Agriculture searchable list of farmers markets.